Maybe they should be called the Chamber of Irony. Put it this way: the Chamber has a lot of first hand experience with frivolous lawsuits — filing them, that is. 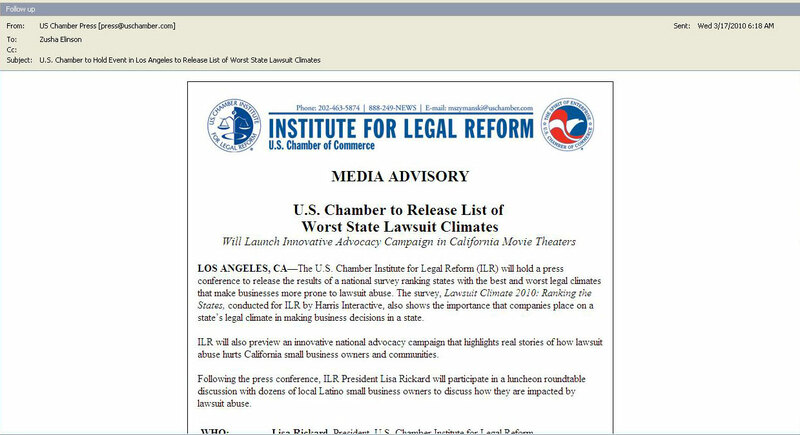 The Electronic Frontier Foundation and Davis Wright & Tremaine are currently defending political pranksters the Yes Men against a questionable lawsuit filed by the Chamber over a mock press conference and web site. In October, the Yes Men staged a press conference announcing that the Chamber was reversing its position on climate change and would stop lobbying against climate change bills. Watch it below and see the real Chamber of Commerce dude come in and interrupt the spoof and be forced to answer questions about climate change. The Yes men also had a fake web site. The real Chamber got the web site shut down and then filed a lawsuit in federal court, alleging trademark infringement and, we imagine, hurt feelings. Frivolous lawsuits are not good. For one, the above link was filed by the plaintiffs Maryann Morrison and Morrison Intermedia Inc. The defendant in the case claimed the suit was frivolous and that the plaintiff was seeking quick financial settlement. In this case, the defendant stood firm and won the case while the plaintiff lost. The attorneys that represented the losing side were Mark Underhill (Underhill Boise Parker) and Paul Mendes (Lesperance Mendes Lawyers). Also, in the BC Courts, there is a previous lawsuit from the 1990s under the name Maryann Yeomans where she sued Simon Frasier University. The case involved a domestic dispute she had on the campus grounds. SFU settled outside of court. Stand firm on Frivolous Lawsuits. In October, the Yes Men staged a press conference announcing that the Chamber was reversing its position on climate change and would stop lobbying against climate change bills. This is what the focus.